Treasures of South Florida Libraries.Diocese of St. Augustine. St. Augustine Parish Registers, Baptisms, Marriages, Burials, 1594-1638. 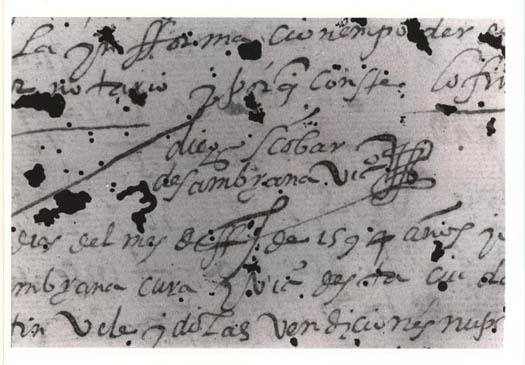 Signiture of Diego Escobar de Sambrana. Diocese of St. Augustine. Archives. Jacksonville, Florida. The Diocese of St. Augustine maintains the original Cathedral-Basilica Parish registers of St. Augustine dating from 1594 to 1881 and episcopal archives of the diocese from 1857 to 1967. The Archives also handles requests for information on genealogical research and the history of Catholicism in Florida. St. Augustine Parish Registers. Baptisms, Marriages, Burials. 1594-1638. Marriage of Gabriel Hernandes with Catalina de Valdés, February 2, 1594.Manuscript. Volume 1, leaf 89. In fifteen folio volumes, containing 1,340 pages, are the oldest written records of American origin in the United States. The baptism, marriage, confirmation and burial records of early Spanish St. Augustine provide a wealth of parochial and genealogical information for the historian, scholar and researcher. The records contain information on the origins of many Spanish, black, Indian and other racial and ethnic groups in colonial Florida. The registers date from 1594, as records for the first twenty-nine years of the parish were lost or destroyed, and form a continuous record through 1763, when Spain ceded Florida to England. In 1763, departing Spanish officials transferred the registers to Cuba, where they remained in the archives of the Cathedral of Havana for 143 years. Bishop Augustin de Verot, the first bishop of the Archdiocese of St. Augustine (appropriately), discovered the register in 1871. The registers were ultimately returned to their proper parish church, in St. Augustine, Florida, in 1906. In 1939, the registers were disbound and pages were laminated in "protective" sheaths of cellulose acetate sheets, through participation in a cooperative program with the Carnegie Institute and the National Archives. Book and report of the persons who have been married in this city of St. Augustine, provinces of Florida, by Diego Escobar de Sambrana, curate and vicar in this city, dated 24 January 1594 years. On the second day of the month of February of 1594 years, I, Diego Escobar de Sambrana, curate, chaplain and vicar of this city and fort of St. Augustine, provinces of Florida, now married by words, as the Holy Mother Church of Rome commands, and I married Gabriel Hernandes, soldier of this presidio, with Catalina de Valdés. The said Gabriel Hernandes gave sufficient information of how he was a single man and had no impediment. They gave three marriage banns. This information is in the possession of Andrés de Sotomayor, Notary, and because it (so) advises, I signed it with my name. [Signature of Diego Escobar de Sambrana], Vicar.